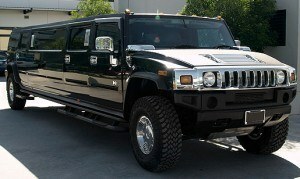 Available in three colours – black, white and pink, the Hummer Hire H3 is the most frequently hired Limo owing to its captivating look and cheap limo prices. The exquisite interior breathes an air of luxury and glamour into your travelling experience – be it a prom, birthday or simply an overnight journey. There is enough space to comfortably accommodate eight people along with 2-3 large bags of luggage. The disco and fiber optic lights make the interior decorous and enchanting, while the stylish look of the ride leaves all the onlookers spellbound. The journey is also made supremely comfortable and equally ostentatious with leather seats and illuminated floors and ceilings. The Limousine also comes with complementary drinks that are kept chilled in the lighted stylish bar, casting the feeling of a personalized nightspot. Along with a radiant appearance, the Hummer H3 also offers a variety of entertainment option to make your journey relaxing and fun. You can play your favourite music in the CD player or just sit back and watch a movie on the television. The privacy window divider gives you complete privacy from the driver, while still allowing you to interact with him through intercom whenever you want. Find out more and get a free quote on hummer hire now on 020 3475 2693!